2 Chronicles 20:14-19 D) The Delightful Answer to Prayer: Answers to prayer come when God speaks. Answers to prayer come when God speaks. Then in the midst of the assembly the Spirit of the LORD came upon Jahaziel the son of Zechariah, the son of Benaiah, the son of Jeiel, the son of Mattaniah, the Levite of the sons of Asaph; and he said, “Listen, all Judah and the inhabitants of Jerusalem and King Jehoshaphat: thus says the LORD to you, ‘Do not fear or be dismayed because of this great multitude, for the battle is not yours but God’s. ‘Tomorrow go down against them. Behold, they will come up by the ascent of Ziz, and you will find them at the end of the valley in front of the wilderness of Jeruel. You need not fight in this battle; station yourselves, stand and see the salvation of the LORD on your behalf, O Judah and Jerusalem.’ Do not fear or be dismayed; tomorrow go out to face them, for the LORD is with you.” And Jehoshaphat bowed his head with his face to the ground, and all Judah and the inhabitants of Jerusalem fell down before the LORD, worshiping the LORD. 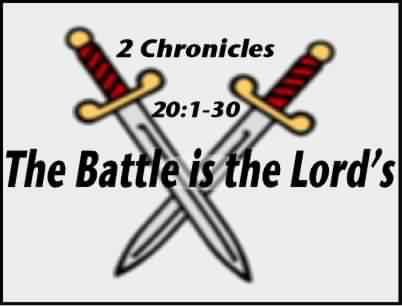 And the Levites, from the sons of the Kohathites and of the sons of the Korahites, stood up to praise the LORD God of Israel, with a very loud voice (2 Chronicles 20:14-19). What we read here is an Old Testament way that God worked. Not everyone had the Spirit of God like we do. Nowadays, God speaks directly to our hearts. But in the Old Testament, He sent a prophet to tell someone what God thought they needed to hear. As all the people were seeking the Lord, the prophet spoke to everyone. His message is very interesting. He first communicated His care about them and told them not to worry and then told them how He was going to deliver them. The key here is that God did speak. The great thing about a crisis is that the need and the answer are both rather urgent. One can see how one connects to the other. Remember how we heard that our lease for the church was going to be increased many fold last year? We prayed to the Lord and we came to an amount we could sensibly deal with. At the same time God was using that to alert us to the need of a new building. God is wise. We can say it is the evil one and yet God triumphs to accomplish His will. God’s words of comfort are always so meaningful. Once we hear them, they are like a healing stream poured out into our troubled hearts. We are desperate, so vulnerable. We have no solution. We have no where to go. We are seeking God. We hope He hears us. But then we hear His Words. They can come in any number of different ways but often it is right through our devotional times with Him. What did this people hear? God simply told them that they need not fear or be upset. He understood how this great multitude had great aims at eliminating Judah as a people. But He has seen to it that it would not happen. “The battle is not yours but God’s.” When God stated that He is going to take care of a problem, we can trust Him. Now we can’t tell Him how He is to do that. We would simply want the problem to vanish. But God wants us to establish a deeper relationship with Him. He wants to build up our faith and trust in Him so that in such times as this we can trust Him. 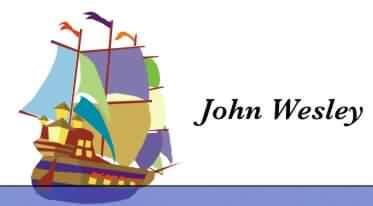 Some of you have heard of John Wesley, the man that has shaped England more than any other. This story that I am going to read was early on before his conversion crossing over the Atlantic to Georgia. The ship had several times been shaken by storms. The English people on board were greatly shaken. And so was he (he wasn’t a believer at that time). But something was different about the Christian Moravian Germans. "At noon our third storm began," he noted in his Journal on board the "Simmonds" on Jan. 25, 1736. "At 4, it was more violent than before. Now, indeed, we could say, 'the waves of the sea were mighty, and raged horribly.' They rose up to the heavens above, and 'clave down to hell beneath.' The winds roared round about us ... The ship not only rocked to and fro with the utmost violence, but shook and jarred with so unequal, grating a motion, that one could not but with great difficulty keep one's hold of anything, nor stand a moment without it. Every 10 minutes came a shock against the stern or side of the ship, which one would think should dash the planks in pieces." It was in the midst of this ferocious storm that Wesley admitted to being "much ashamed of my unwillingness to die," but also became tremendously impressed by the calm behavior of the 26 German Moravians who were among his fellow passengers. At the height of the storm, they calmly continued in prayer and praise to God (unlike their "crying, trembling neighbors," as Wesley described them). “A terrible screaming began among the English. The Germans calmly sang on. I asked one of them afterward, “Were you not afraid?” He answered, “I thank God, no.” I asked, “But were not your women and children afraid?” He replied, mildly, “No; our women and children are not afraid to die.” (The Journal of John Wesley, page 36). This is different than actually do something. This is the instruction that call for faith. It is our opportunity to trust God. What is it that God asked them to do? Not much really, simply, “Tomorrow go down against them.” But hold it, are they not a great multitude that will wipe them out? Sure. So God’s advice is to commit suicide? Right? No. That is how the evil one would tempt God’s people at such a time. If he cannot dissuade us earlier on, he comes at us again and again. There is always a time to disbelieve God’s Word. But when one is desperate, what does one have to lose? At least they hear God giving them advice. This is why I believe it is easier to wholly trust God in dire circumstances and why self-reliance, the modern evil, is so devilish. God went on and said more though. Usually God speaks just as loud and clear as needed. Pay attention to everything that He has said. If you don’t understand something, ask Him right away. But don’t ask with doubt about God’s intention or purpose, but only on clarification as to what you need to do. God usually heals us in our hearts with His Word and then gives us instructions on our part. I mentioned that we don’t usually do much, at least compared to God. This is because in times of crisis we literally cannot do much. This circumstance is very unusual. God said that they did not need to fight at all. The generals probably didn’t like hearing this. But what did it matter? The key here is that even though they were not to fight they were still to respond. Pay attention very closely to what God wants you to do. Don’t do more or less than He asks of you. He will give you everything you need to do your part. In this case, they were only to go and watch. They were not to fight. But the point is that they still needed to go. They still needed to respond to God. This is always the case for it is the time to respond to God. This is where we put our faith to the test. By responding we say with our actions that we believe what we heard. If they didn’t believe God, do you think they would have obeyed God? Certainly not. Even if it was easy, it was too easy. It is surprising that a number of people turning away from saving faith because believing in Jesus is too easy. Easy for us but it was easy for the Lord. Jesus suffered for us. When religionist focus on their own good works, they believe that it is only through tough measures they can find hope for salvation. They just reject anything too easy. The matter of the fact is that they could not accomplish it on their own. If they could, then Jesus would not need to have come. Application: Have you ever scoffed at God’s easy way? Will you now believe? Will you now obey? Tell the Lord no matter what He asks, you will do it. Then do it! Next => E) The Required Faith for Prayer (2 Chronicles 20:20-23) We always are asked to prove our faith. A) The Urgent Need for Prayer (2 Chronicles 20:1-2) Difficulties lead us back to God. B) The Proper Time for Prayer (2 Chronicles 20:3-4) Fears always should lead us to trust God. C) The Needed Substance of Prayer (2 Chronicles 20:5-13) Prayer is where our trust is given to God. D) The Delightful Answer to Prayer (2 Chronicles 20:14-19) Answers to prayer come when God speaks. E) The Required Faith for Prayer (2 Chronicles 20:20-23) We always are asked to prove our faith. F) The Blessed Reward of Prayer (2 Chronicles 20:24-30) God always blesses those who seek Him. Most of BFF articles such as this one is nicely formatted for printing. Check out the great number of articles on the BFF Biblical Training Libraries all for one low cost. Make sure you check out the deal!